The vehicle impounded by Naya Gaon police for using loud-speakers without permission. In the first case of poll-related violence, supporters of the Congress and the SAD clashed here last night, leaving at least one person injured. The area, which is part of the Morinda Assembly segment, is expected to witness a keen triangular contest. Protesting Congress workers, led by the party candidate, Mr Jagmohan Singh Kand, blocked traffic on the Chandigarh — Khuda Alisher road for more than a hour here today. While addressing a protest rally against last night’s attack on his supporter, Mr Kang charged that supporters of the SAD candidate, Mr Ujjagar Singh Badali, were threatening his supporters. He alleged that the District Administration was siding with the candidate of the ruling Akali Dal. He warned that if any untoward incident took place, the District Administration would be held responsible. Later, Congress activists burnt an effigy of the Punjab Chief Minister near his residence in Chandigarh. However, the situation took a serious turn when the police impounded the campaign vehicle of Mr Kang for violating the order of the SDM regarding the use of loud speakers. Tempers flared when Congress supporters protested against a move by the police to register a case against Mr Jagmohan Kang. They said as the violation had taken place in the jurisdiction of the Chandigarh Police, it should have been handled by it. The matter was later referred to the UT police, said police sources. Mr Kang was here to hold a protest rally against an assault on his supporter, Mr Manjeet Singh Kamboj, allegedly by the ‘‘supporters’’ of Mr Ujjagar Singh Badali last night. Mr Jagmohan Kang said the road blockade was also aimed at pressurising the district authorities and police officials concerned to arrest the persons involved in the last night’s assault on Mr Manjeet Singh Kamboj. However, the blockade was lifted after Ms Kalpna Nayak D, Assistant Superintendent of Police (Mohali), assured Mr Kang that all efforts would be made to book the culprits and the SDM (Kharar), Mr Davinder Singh, assured him that he would look into the matter whether the alleged violation of SDM’s order took place in Naya Gaon or in Chandigarh. Mr Manjeet Singh Kamboj, president of the Joint Action Committee, Naya Gaon was allegedly assaulted by three un-identified youths last night. Mr Kamboj suffered injuries on his forehead. ‘‘One of them hit me with an iron punch and they latter fled in a Gypsy which was already occupied by other youths’’, said Mr Kamboj and added that while fleeing they raised slogans in favour of Mr Ujjagar Singh Badali and the Badal government. A case under Sections 323, 506 and 148 of the IPC has been registered. However, Congress supporters are demanding that the accused should be also booked for attempt to murder under Section 307 of the IPC. Meanwhile, the ASP, announced that security and patrolling in the Naya Gaon area will be beefed up. For the purpose additional forces would be deployed and an additional vehicle would be given to the local police station. On the other hand, supporters of Mr Badali accused the Congress of giving political colour to attack on Mr Manjeet Singh Kamboj. Mr Darshan Singh Chug, co-convenor of the SAD-BJP election committee for the Morinda constituency, claimed that last night’s attack on Mr Kamboj had nothing to do with elections and the Congress was trying to tarnish the image of Mr Badali. 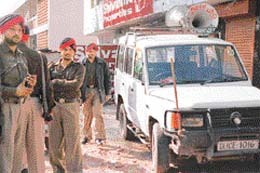 Several political leaders and civil officers in Punjab have lost the armed security cover provided by the Punjab Police. The cops withdrawn from the security cover of the protected persons are being deployed with candidates contesting the elections. Already, the security cover of at least 15 political leaders, distinguished persons, civil and police officials in the Ropar district has either been withdrawn or heavily pruned. Orders have been passed to remove four policemen posted with the State Transport Commissioner at Chandigarh. The strength of cops with the sitting MLA from Morinda seat, Mr Ravi Inder Singh, had been reduced from 11 to 4. Since Mr Ravi Inder Singh was recontesting from the Morinda seat on Panthic Morcha party ticket, he had to be provided with at least four security personnels as per the directions of the Election Commission. One of the three police personnel with a former MLA from the Kharar, Mr H.S. Gharuan, who is now contesting from the same seat as an Independent candidate has been withdrawn. The district police had so far withdrawn 20 personnel from the security cover of at least 15 persons. The politicians who have lost the security are from the SAD, Congress and the Panthic Morcha. The security cover of at least two more politicians who are contesting from Kharar and the Chamkaur seats, respectively, has not been withdrawn. Instead the Congress candidate from Chamkaur Sahib ( SC) seat has been provided more cops. The exercise to review the security cover of other persons was in progress, said a police official. The ADGP (Security), Punjab, had directed the Senior Superintendent of Police, (SSP), Ropar, to review the threat perception of the political leaders, distinguished persons and civil officials. Those who figure in the threat perception list of the police are, however, being allowed to retain the security cover — which has reduced in certain cases. There were certain cases in which the district chiefs of political parties, advocates, retired judicial officials and retired bureaucrats were enjoying the security cover because of their “influence”. A senior police official said there were 76 candidates in poll fray the five Assembly segments of the Ropar district. While the candidates contesting on a party symbol had to be provided four cops, an Independent candidate was to be provided two police personnel. The Chandigarh Administration has decided to confer Administrator’s Police Medal for Meritorious Services on eight personnel of the Chandigarh Police on the eve of Republic Day 2002. Those being honoured include Inspector Daljit Singh (RI Lines), who is a qualified drill instructor and has been awarded 78 commendation certificates in his 38-year career. SI Subhash Chander Mehta (Traffic staff) is in charge of the Children Traffic Park and has contributed towards road safety measures. He has earned 124 commendation certificates. SI Har Sahai Sharma (I/c Bapu Dham Police post) has investigated important cases and earned 68 commendation certificates. ASI Raghu Nath Tyagi (RTC Police Lines), who has worked in various wings of the local police, has earned 40 commendation certificates, and ASI Charanjit Singh (Reader SP Operations) has earned 101 commendation certificates while working with various branches of the police. HC Ishwar Dev (Reader DSP/EOW) has received 94 commendation certificates, while HC Ramesh Chand (CID) has earned 53 commendation cards. Both have a varied experience in various units of the local police. HC Mahi Pal, working at the Police Headquarters, has earned 35 commendation certificates. Mr R.S. Gujral, Home Secretary, UT Administration, objected to a write-up titled “R-Day honours: it is all politics” published in Chandigarh Tribune on Thursday and said it was “factually incorrect”. In a communication, he said: “Ït has been alleged that the list makers are reportedly ‘weighing the political connections of sports persons so as to decide upon the awardees for the year’. The article goes at great lengths to describe how the Chandigarh Administration has failed to honour Ms Gurpreet Kaur for her outstanding achievements in rowing. I may bring to your notice that Ms Gurpreet Kaur was honoured by way of a commendation certificate on Republic Day last year by the Chandigarh Administration, in recognition of her outstanding contribution to sports in the field of rowing. This fact has been published in your newspaper dated 24.1.2002. “Arvind Katyal, who has authored the write-up, has taken pains to show that the Chandigarh Administration is unfair to sportspersons and is influenced by considerations other than merit. The author of the article has neither cared to obtain the version of the Administration nor has he verified the facts before publishing the above article. In fact, Gurpreet Kaur and her mother had also met me today and stated that the correspondent had not even talked to them and that the news item was totally false”. In view of the Republic Day celebrations, several traffic restrictions have been imposed near the venue of celebration in city. The road stretch from the Sectors 16-17-22-23 roundabout to the small rotary near Gurdial Singh Petrol Pump on the Sectors 17-22 dividing road, the road from the Sectors 16-17 crossing to the Sectors 16-17-22-23 roundabout, and from the light point near Lyon’s Restaurant to the Parade Ground, will remain closed to the general public and vehicles from 7 am till the conclusion of the Republic Day celebrations. No parking will be allowed in the parking lot in front of shops in the Sector 22-A market from 7 am onwards. Spectators can park their vehicles in the parking area in Sector 22-B, adjacent to the Blood Disease Hospital in Sector 23-B. The Sector 21 auto repair market would remain closed on Republic Day. This was informed by Mr S.S. Purba, president of the Auto Dealers Association, Sector 21, on telephone. The Municipal Council has identified a site, 7 km from here for shifting dairy farmers from the township. This 55 acre plot in Bhagwanpur Panchyat , is being acquired for setting up a dairy complex. Around 180 dairy farms of the township will be relocated in the new complex and the menace of stray animals will be reduced to a great extent. All dairies having more than five cattle , will be shifted in this new dairy complex. It is learnt that the dairy farmers will be allotted land in this complex in proportion to the number of heads of cattle owned by them. They owners will have to develop the allotted piece of land on their own within a year of being allotted the land, sources said. It may be noted that the MC has not issued any licence to the dairy owners in Panchkula , as stipulated in Haryana Municipal (Cow Houses ) Bylaws , for this year. This has been done to ensure that the dairy owners can shift to the new site at Bhagwanpur, once it has been acquired. The new site has been selected after a site selected at Kot village in Barwala block was rejected because a seasonal nullah on the site. It would have been very expensive to divert the nullah and the cost of developing the land would have been heavy for the MC. Also, this site was located at a distance of about 15 km from the township. Meanwhile, the government is reportedly considering a proposal for private parties being invited for rounding up stray animals. Yesterday, a meeting was held in the office of Additional Director, Urban Development with regards to modifying the Owner-less and Stray Cattle Bylaws in the Haryana Municipal Act and Municipal Account Code. One of the amendments recommended by a three-member committee set up by the government, also dealt with fines being imposed on dairy farmers for letting their cattle roam on road. They have recommended that these fines be pocketted by the Municipal Council concerned rather than being sent to the State Treasury. The three-member committee, comprising Executive Officers of the Municipal Councils of Ambala, Panchkula and Jagadhari, had submitted its report to the Director, Urban Development. They have proposed that tenders be invited from private contractors for rounding up these stray animals within the Municipal Council limits of various towns and cities in the state. Before the Municipal Council was constituted, the Haryana Urban Development Authority (HUDA) had given contract for rounding up of stray animals in the township. The fines imposed on the erring dairy owners were also reportedly being pocketed by these contractors. As of now the MC has given the contract on a trial basis, after the responsibility of stray animals was assigned to it. Star channels’ black-out being considered by local cable operators following a steep hike in subscription, seems to have been delayed as cable operators will like to link the fight to consumers’ interest before taking up cudgels against TV channels. The Chandigarh Cable Operators executive here today discussed the blacking out of the bouquet of Star TV channels but could not decide on the issue, sources said. The operators were now considering to join their fight with that of the consumer who was being asked to bear a heavy hike with profit margins of operators thinning in the process so as to stay in the business facing a fear of direct-to-home (DTH) service overpowering them. The operators felt that if the experiment of the Star TV management succeeded, the operators might have to close down as rates would gradually have to be increased to around Rs 350 which would make it feasible for the direct-to-home service to become operational. They said this move of the hike had to be resisted because if it went unprotested Zee, Sony and other TV channels would follow suit. There were fears, however, among cable operators that their Star black-out plan had to be worked out comprehensively so as not to leave a scope for a section of cable operators and four multi-system operators (MSO) of the city to take over the whole business of cable operators. The operators were opposing the Star TV move asking them to pay Rs 41 for its six channels and Rs 24 for ESPN and Star Sports. The operators were not sure whether the subscriber would accept the hike or not and were afraid if subscribers accepted the hike then disgruntled elements among them would like to still provide the service. The scenario had made the cable operators in the city doubtful about their move to black out Star TV which was among the most popular bouquets of channels. The cable operators, who had been in the field for almost a year, were also sour due to the government’s apathy towards them, saying the government had not made any regulatory efforts. In the absence of any regulatory framework, they were being charged with trespassing if they tried to plug cable theft. Operators were keen to check alleged monopolistic attempts by TV channels like the Star TV which did not allow them to choose the channel of your choice and instead they had to take the whole packet of these channels. The dilemma of operators to check the Star TV attempt through whatever means, would again come up for discussion in couple of days at their meeting. Operators felt the subscriber was now caught in the game of TV channels which, unlike, Europe where channels earned through subscription, would like to burden them as well as earn through advertisement revenues and squeeze out cable operators to make way for DTH service to run these channels themselves. A section of the city residents today reached a compromise with the cable operators, who offered separate tariff packages for the residents, even as the dharna by Mr Hemant Kinger and the District Youth Congress continued outside the DC office today. The Panchkula Cable TV Association led by its president, Mr Rajesh Sondhi and Mr Mayank Bansal, general secretary, has offered various tariff packages for that of Rs 200 per month; Rs 550 for three months; Rs 1100 for six months and Rs 2100 for a year. A section of residents led by the founder of Peoples Voice God’s Voice Group, Mr B.L. Tandon, has more or less agreed to this by demanding a further reduction of anything between Rs 50 to Rs 100 for each installment. Mr Tandon, in a statement to the press, alleged that certain leaders were exploiting the situation , when they themselves had paid the tariff of Rs 200 per month. He said that the compromise with the cable operators also ensured that there would be no further hike in charges during the entire year. The anti-paid parking Joint Action Front (JAF) will lay a siege on the Municipal Corporation of Chandigarh (MCC) on January 28 at the time of first meeting of the second Municipal Corporation to oppose the imposition of paid parking to be discussed in MC House. This was decided by members of the front, comprising a section of traders and employees, at a meeting held today at Sector-17. Representatives of political parties and others were also invited to take a decision in this regard, the JAF spokesman Jagdish Kalra announced. The meeting, however, today seemed to have scaled down its campaign against paid parking by pointing at flaws in the parking system. Mr Kalra, however, denied this by saying that every speaker in the meeting wanted removal of paid parking and entry fee system in the paid-parking zones. The front also demanded an inquiry into the change of conditions for the contract for paid parking and fixing responsibility on those officials or political leaders who changed conditions ignoring public interest. The meeting was attended, amongst others, by a section of Punjab, Haryana and UT Government employees, representatives of different market associations and couple of Residents Welfare Associations. He said political parties were trying to weaken the movement against but it was turning into a mass protest. Political leaders, except for the Chandigarh Vikas Manch Councillor Mr Jitender Bhatia, were conspicuous by their absence in the much-trumpeted meeting held today. Fiftyone out of 57 housing societies were today handed over letters of allotment after more than a decade of wait and almost four-fold escalation in land cost due to legal wrangles. Allotment letters to Sargoda House Building Society, Sector-44, and Sector-16 House Building Society could not be given today due to allocation of land out of proportion to their member strength. They will, however, be given land in couple of days. The letters of allotment were handed over by the Adviser to the Administrator, Ms. Neeru Nanda, in a simple function also attended by Finance Secretary Karan Avtar Singh, Housing Board Chairman G.K. Marwah, Deputy Commissioner M. Ramasekhar, Chief Engineer Puranjeet Singh, Housing Federation Chairman Sunil Parti and Joint Finance Secretary KAP Sinha, among others. The possession of land will be given only after the allottees deposit free hold fees at the rate of Rs 350 per square yard. The land price alone has increased from Rs 750 in 1991 to Rs 2850 now. The remaining four societies will be allotted land as soon litigations regarding them are cleared. Seven members are in the fray for five vacancies of the Municipal Corporation’s most powerful body, Finance and Contract Committee (F&CC), on the closing day of filing of nominations today. Six members today filed seven nominations, including two from the Congress, three from the BJP and SAD, one from the Chandigarh Vikas Manch (CVM) and one nominated. Mr. P. C. Sanghi had already filed his nomination on the first day of filing of nominations. Six councillors who filed nominations are: Brigadier Sant Singh (nominated), Vijay Singh Rana (CVM), Rajesh Gupta (BJP), Harjinder Kaur (SAD), Subhash Chawla and Kamlesh (both of the Congress). Mr Gupta filed two sets of nominations taking the total number of candidate to seven. Brigadier Sant Singh also seems to be through as six of the nine members had supported his candidature in a meeting yesterday. Remaining three seats have to be shared amongst four remaining candidates with BJP-SAD having four votes, CVM three and Mr Sanghi seemed to be having three votes of first preference. Mr Sant Singh’s name was proposed by another nominated councillor Dr K. S. Raju and seconded by Mr C. K. Sawhney; Mr Rana’s name was proposed by his party colleagues Jitender Bhaitia and Harpreet Kaur Babla; Harjinder Kaur had Kamla Sharma as proposer, while Rajesh Gupta seconded it and Rajesh Gupta’s names was proposed by Kamla Sharma and seconded by Harjinder Kaur in one set. Mr Gupta had Mr Gyan Chand Gupta as proposer, while Ms Kamla Sharma seconded it in the second set. Mr Subhash Chawala’s names was proposed by Anu Chatrath and seconded by Sohan Lal. Ms. Kamlesh’s name was proposed by Mr Kuldeep Singh and seconded by Ms Geeta Rani. The Congress seems to be in a position to help a candidate outside the party with two votes. The Excise and Taxation Commissioner has reportedly assured members of the Chamber of Chandigarh Industries of extension of the date for deemed assessment and of expediting the assessment on the pattern followed by Punjab by giving it wide publicity in newspapers. A delegation of the chamber today attended a meeting convened by the Excise and Taxation Commissioner Mr M. Ramshekhar. Mr A.L. Aggarwal, general secretary of the chamber, stated in a press note that the commissioner had assured them that the date would be suitably extended in order to cover maximum number of sales tax assessees and the financial year up to which the deemed assessment should be done would also be extended from 1997-98 to 1998-99. “On chamber’s request, the commissioner has also agreed to organise camps in Industrial Area Phase I and II here, to enable industrialists to submit their cases for deemed assessment on the spot. The officials also assured us that once the papers, are submitted, the acknowledgement itself shall be the assessment order unless any discrepancy is communicated by the department to the assessee within a year of the date of issuance of acknowledgement”, stated the press note. The chamber also requested the commissioner to follow the Punjab pattern vide which the sales tax proforma is printed on the back of the invoice as a proof of receipt of goods and there is no need of issuing of ST XXII form by the purchaser. “The commissioner informed us that this proposal has already been forwarded to the Central Government authorities”, the note stated. The chamber also suggested that sales tax forms should be easily available as several assessment cases were pending due to this reason. Ms Neeru Nanda, Adviser to the UT Administrator, today released a booklet ‘Greentoons and Essays’ on the 5th anniversary celebrations of the Green Environment Club, Chandigarh at the Government Central Craft Institute (CCI), Sector 11. She was the chief guest on this occasion. Ms Nanda said she would direct the Director, Social Welfare, Chandigarh, to visit the CCI to make provision for providing loans of Rs 5000/- to each girl trainee. While speaking on the occasion, she said Environment awareness was essential in this age of rapid urbanisation. Ms Nanda further said “there is a practice in countries like China that food and craft products prepared by the trainees are sold in the market with profit going to the students during their study period”. She awarded the gardener of the CCI with Rs 500/- for keeping the institution green and clean. Mr Ishwar Singh, Director, Environment, Chandigarh said preserving environment was the need of the hour and added that 100 Eco-Clubs had been formed in various city schools to create environment awareness. Ms K. Ranga Rajyam, chairperson, Green Environment Club, Chandigarh said their club had organised awareness campaign, conducted workshops, seminars, debates and competitions on the environment preservation A cultured programme was also organised on the occasion. Led by the SDM (Central), Mr Pirthi Chand, Food Inspectors yesterday conducted raids on the Sector 21 Meat Market and markets of Sectors 22 and 23 and challaned shopkeepers under Rule 3 of the Recycled Plastics and Usage Rules, 1999, framed under the Environment (Protection) Act, 1986. They also challaned shopkeepers under Rule 49 and 40 of the PFA Act. A team of Food Inspectors led by Mr Gyanesh Bharti, SDM, raided Markets in Attawa village and Sector 37 today morning and challaned shopkeepers under these Acts. The shopkeepers had been warned to comply with the provision of these Acts. Experts, who are here to discuss various techniques of vulture monitoring and for conducting bird surveys, today visited Morni to see nesting of white-backed vultures of the GYPS species. It is learnt that the experts, who are participating in the five-day workshop being organised by the Bombay Natural History Society, went to Badisher in Morni and saw two nests of this endangered species of vultures. This was the fourth day of the workshop. A 40-year old woman, Pinki Sharma, who was reportedly involved in about 200 cases of thefts and burglary, has been apprehended by the local police from Sector 23. A resident of Mohali, Hukam Singh, was injured when his scooter was hit by a Maruti car near the Sector 11 rehri market. He was admitted to the PGI. The car driver managed to escape. Theft cases: A Ropar resident, Abhisekh, has reported that the stereo of his car which was parked outside DAV College, Sector 10, has been stolen. In another case, a Sector 38-West resident, R.S. Bhanot, has reported that the battery of his Kinetic Honda scooter, parked in the Sector 37 market, has been stolen. A Mani Majra resident, Dhiraj Awasthi, has reported that the shield of his scooter, parked at his residence, has been stolen. A resident of Khumar Colony, Karam Chand has reported that some utensils have been stolen from his residence. The police has registered separate cases. Car stolen: A car ( DL- 6CM- 4883) was reportedly stolen from the Sector 2 residence of Mr Sanjay Garg during the night intervening January 18 and 19. The police has registered a case under Section 379 of the IPC. Rash driving: The police booked the driver of scooter (PB- 70- 1636) on charges of rash and negligent driving from Sector 11 on Wednesday. One assaulted: Manohar Lal Arora, Nelam Arora, Ajay and Jyoti Prakash have been booked on the charge of assaulting Nathi Sharma.